Participating in the Pace Pitch Competition truly helped propel my company, www.NewlyWish.com, from being a good concept to a becoming a fully operational business. While the prize money has been very helpful in covering some of our operational expenses, and the prize of six-months of office space at Tech:Space allowed us to move out of our apartment and take on additional staff members, the discipline of developing a fully-formed pitch, backed by a comprehensive business plan, along with the feedback and guidance we received from the judges and Bruce really helped us to identify not only potential weaknesses in our approach but, perhaps more importantly, the strengths we needed to accentuate. This, I believe, is the most important message for all of you who are thinking about participating in the Competition - even if your business ends up a far different place than you planned, the work you put into developing a business plan, the feedback you get from the mentors and judges, and the opportunity to prepare and deliver a three-minute pitch, will all prove to be invaluable as you work to get your business off the ground. The NewlyWish online wedding registry platform provides engaged couples and gift-givers with a registry experience that offers the choice, convenience and personal style they want and expect. NewlyWish is dedicated to supporting New York City’s vibrant community of independent stores and service providers by uniting them with registrants and gift givers nationwide, and, in addition to all of the traditional gift items, allows previously uncommon or unattainable gifts to be listed together in a single, cohesive and easy-to-use online registry. Visit www.NewlyWish.com to see for yourself! 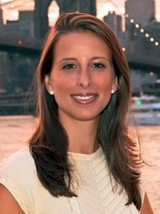 Prior to launching NewlyWish, Amanda had returned to Fordham University (where she also received her BS) to pursue an MBA at the Graduate School of Business after spending 7 years working at the Federal Reserve Bank of New York. I participated in the Pace Pitch Contest in December of 2007. I was just moving to New York from Silicon Valley, and as a recent MBA I was excited when I found the Pace Pitch Contest. It's one of the best pitch competitions in NYC; some of the great aspects of the contest is the mix of ideas and stages - from idea-stage, to already launched - as well as the mix of backgrounds of entrepreneurs pitching. I pitched my company, CollegeWikis, which had begun to get traction and focused on connecting students to share information with each other in an online forum. We were fortunate to win; there were many other strong entries. After the competition, I met each of the judges as well as various angels who attended in the audience. Through participating, I was able to improve my pitch; within a few months after the contest, I had a term sheet from HighBAR Ventures. We raised money in 2008 (New York Times article), and the company has become Regroup.com; the premiere communications platform for schools, organizations, and companies. Joe DiPasquale is the founder and CEO of Regroup.com, a group communications platform for schools, companies, and organizations. Regroup won the Pace Pitch Competition in 2007 under its former name, CollegeWikis. In 2008, Regroup raised a $2M seed round led by HighBAR Ventures, the early stage venture capital firm founded by Bill Joy, Andreas Bechtolsheim, and Roy Sardina. Previously, Joe worked in Strategy Consulting for Bain, IBM, and McKinsey, and in investment banking at Deutsche Bank. He grew up in Connecticut and Alabama, completed his BA at Harvard and MBA at Stanford, and worked in Amsterdam and Berlin before moving to NYC in 2002. Yamodo has found success thru hard work, passion and the support of programs like the Pace Pitch Contest. The Pitch contest was the first attempt by Idea Storm to create an authentic business plan regarding Yamodo. It was because of the Pitch contest that Idea Storm was able to fully articulate Yamodo's planned success. The aftermath of the Pitch included an array of great contacts having been introduced and a focused plan of attack for the years to come. The Yamodo brand is known for its series of imaginative drawing games that encourage creativity and laughter in all ages. In the early days, funding came from a collection of credit cards and personal savings, while also maintaining full-time jobs. As word spread, solid distribution and positive sell-thru allowed Idea Storm to repay all debts and become profitable. Bill Phelps graduated from Virginia Tech with a bachelor's degree in industrial design. Since then, he has enhanced his professional career by teaching design courses in Australia, establishing a product consultancy, and working for a variety of entrepreneurial companies. Bill's passion for products, people, and creative opportunities has been the driving factors in his career choices. Bill's design background is tempered by a strong business and entrepreneurial drive that is enhanced by a hands-on approach to all aspects of a job. Currently Bill is finishing his MBA at Pace while growing his startup company, Idea Storm Products (creator of the Yamodo game). In the years since winning the Pitch Contest, the Yamodo brand has grown fast, with over 50,000 games produced, and distribution that includes Barnes & Noble and Bed Bath & Beyond. Seeking to capture a portion of the 1+ billion dollar game market, Idea Storm repeatedly leveraged the Yamodo brand to create multiple products that would cater to specific industry niches such as travel, leisure, and family play. The PACE Pitch Competition is a true launching pad. The event was a key milestone that helped me take off the training wheels, and begin my journey in social entrepreneurship. I would encourage all entrepreneurs to enter the Competition and join the strong support community of past contestants, judges, speakers... and of course the dedicated organizers. Alex is a determined serial social entrepreneur. He has applied his drive to do well, by doing good, at ventures in consumer products, advertising, new media, and socially responsible investment. At 17, Alex began his journey by bringing together the corporate and non- profit sector for the Vancouver to Toronto Ride for Youth, winning national press coverage and raising funds for Canadian national organizations. While earning a degree in Economics at Princeton University, Alex took a leave of absence to assist with the launch of TerraCycle, Inc., a company producing the world's first product derived from and packaged in waste. Shifting his focus to media, Alex co-founded international cause marketing agency, Blue Horizon Media, in 2005. The agency gave birth to Rethos, Inc, a network of social media sites devoted to uniting individuals, non-profit organizations, and socially responsible businesses on solutions to social and environmental issues. In 2008, Rethos was acquired by Parta Sustainable Solutions Inc. TSX (PAS-V). Alex is now leading a team to launch a socially responsible investment fund, VisCap focused on bringing the commercial opportunity for socially responsible investment to mass market. A thought leader in the responsible business movement, Alex continues to share his knowledge and passion for social entrepreneurship, corporate responsibility, and socially responsible investing at universities and industry conferences. Participating in the Third Annual Pace Pitch Contest did many things for me. Having to drill down to the essence of my idea so it fit into the 3-minute time frame made me REALLY think about what I believed was the absolute core benefit of the business. Every entrepreneur MUST learn this skill and there's no better way to be motivated. Alan Siege is the founder of Small Business Management Consulting (SBMC), a 12-year old consulting firm focusing on small firms. SBMC helps companies increase profits by improving the way they tell their business story. He has been featured in NY Newsday, CrainsNewYork and Good Housekeeping. He is an instructor for the NYC Department of Small Business Services Entrepreneur Boot Camp, a Kaufman Foundation Certified Facilitator for its FastTrac programs offered by NYC, as well as being an adjunct Professor at the Center for Continuing Education and Workforce Development at the Borough of Manhattan Community College, and the School of Continuing and Professional Studies at New York University.Finally, in a quest to link the fields of entrepreneurship and storytelling, Alan has launched www.OnceUponAVenture.com - a beta web site featuring real-life stories of businessmen and women who seek their fortunes in the wilds of the marketplace. Participating in the Pace Social Venture Pitch Competition forced us to focus our message and introduced us to invaluable contacts within the venture community. Winning the competition gave us capital to increase our advertising budget and to make improvements to the website. Eric graduated from Indiana University in 2005 with a bachelor's degree in finance and entrepreneurship. After graduation, he founded ForePoint Networks, a wireless internet service provider delivering high-speed connectivity throughout rural Indiana which grew to cover over 2,000 square miles of wireless coverage. In 2009 Eric sold ForePoint to publically traded Omnicity Corporation. Most recently he co- founded RareShare, a startup focused on building micro-communities centered around rare medical disorders. RareShare is a conglomeration of online communities focused on the rare disease market. While individually these diseases affect a small portion of the population, together they affect over 30 million individuals in the United States and Europe. Due to the low number of occurrences of these rare diseases, there is often a lack of information, support and communication between people affected. RareShare creates micro communities focused around individuals, families and friends affected by these ailments, allowing them to share experiences, treatment opportunities and support through often times uncharted territory. While for most rare diseases there sites that offer information on symptoms, there are few sites that offer peer to peer support and up-to-date information on treatments. Since its launch in June 2008, RareShare has partnered with health organizations such as the National Institute of Health and the Canadian Organization of Rare Disorders and has been featured in multiple national publications including The Washington Post, TechCrunch and The Toronto Star. RareShare currently covers over 800 rare disorders with 2300 active members. "Losing First Place in the Pace Pitch Contest was the best thing that ever happened to me... After I lost I sought feedback from the judges and used that information to help me retool my business, it also gave the courage to compete in other business plan competitions" The Pace Pitch competition gave me the insight and the drive I needed to pursue my business and never give up. Since competing in the Pace Pitch Contest, her life has completely changed. Ms. Tate was also a finalist in the Pace Pitch Business Plan Competition in 2007. In 2008, she placed third place in the Whitney Young Memorial Conference New Venture Business Plan Competition at the Wharton Business School. Because of her success with blackbridalguide.com, Ms. Tate was also featured in the New York Daily News detailing her account about how she was able to secure funding for her business. Since the launch of her business in 2006, coupled with the her success at the Pitch and Business plan competitions, she has seen a steady increase of sales in her business despite the downturn of the economy. BlackBridalGuide.com was founded by Dina C. Tate. Ms. Tate's eCommerce background began while working as a Website Supervisor for ESSENCE By Mail (EBM). EBM was the parent company of ESSENCE Magazine and the #1 selling African-American women's catalog. During her tenure, Ms. Tate doubled website sales in eight months and exceeded website sales projections by 191%. Ms. Tate presently works as a Senior Content Manager/Project Lead for newyorklife.com while she manages the consumer facing website, all sub sites, micro sites and the company intranet. BlackBridalGuide.com is an online wedding directory for African-Americans. Whether it's looking for a traditional African wedding dress, jumping brooms or authentic African furniture to decorate your home, BlackBridalGuide.com is the destination for you! The goal of the Company is to educate and celebrate. The website will heighten the awareness of African American relationships and honor the heritage of the sanctity of marriage that has been passed through the generations dating back to slavery. Ms. Tate has a Bachelor's Degree from the University of Illinois, a Master's Degree in Management Technology from the Polytechnic Institute of New York University and an Advanced Graduate Certificate in Marketing from Pace University.